Woke feeling very refreshed today, even though we'd had the most boozy night of the trip so far, that being 4 bottles of beer. We are seriously going to be out of touch when we get back! It was also a massive privilege to have a lie in this morning. We grabbed a coffee from the reception area and went back to laze around in the room until it was time to go. We didn't have far to go this morning as we'd decided on returning to Springfield park in Colorado as this would position us well for the slight risk over southern Colorado and northern New Mexico. We knew the park as we'd been there before and it was one of the nicest we'd been to. It was under 2 hours drive away so a short trip and we bought some lunch from their local grocery shop, along with a comfy oversized hoody emblazoned with 'Springfield, Colorado' to keep us warm back in chilly England. It was scorching in the park, but we found a shady spot, wrote the blog, kept an eye on the models, ate and snoozed. Close by in the park, some meteorology uni students were also sitting out and waiting. The variety of weather instrumentation they had atop their vehicles made our single aerial look quite understated, but in time I'm sure we'll acquire that many toys! Before long cloud started to build. Unfortunately, this was not the desirable cumulus field but more of a stratified layer of gunk. This makes it quite hard to spot any of the desired convection, both by eye or from visible satellite images. However, we did manage to spot a couple of slightly more desirable cells within the junk further south, so we went to have a look at these, but we weren't really feeling it. It just looked like it might rain a bit. We decided to have a look at the models for the following day as this may have an influence on what we decided to do with the remainder of today. As it happened the set up in eastern Kansas looked quite appealing. For the first time in a while, cloud bases were forecast to be a lot lower and there was a fair amount of instability and lift in the area. In order to set up for tomorrow we would have to drive about 5 miles north to Lamar and then east across the whole of Kansas. This was definitely do-able, especially if today wasn't going to amount to much. 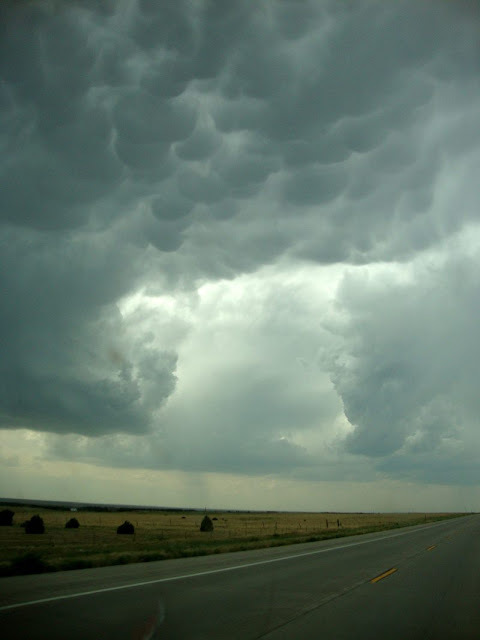 As we headed north to Lamar, it was as though the storms decided to teach us a lesson for ignoring them and little cells started popping up everywhere, all around us in each direction, including some more quite dramatic gloopy mamatus. We weren't getting too excited though as again they were the high based variety that we were now all too familiar with, but they did seem to have quite ferocious hail cores with hail up to 3 inches reported. So we thought it might be fun to park up somewhere in Lamar, preferably find some shelter and let the cells pass us over before heading east to Kansas. 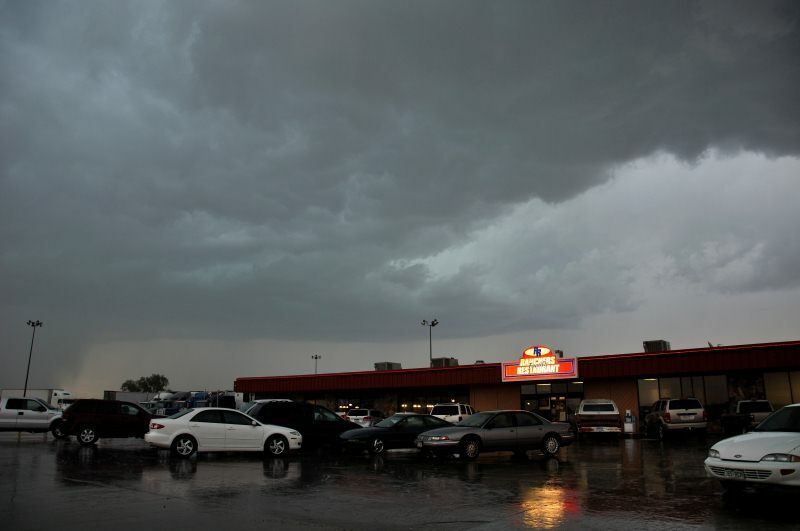 We found a parking lot in Lamar but as it didn't look like we would take a direct hit, we just parked out in the open. The wind was incredible from these cells and we experienced some very forceful downbursts. This is where the rain cooled air from up within the cloud loses all its buoyancy and on reaching ground level, spreads out and causes very strong winds. We used the kestrel weather tracker and recorded gusts up to 38kts / 45mph. The stronger gusts were rocking the car and the accompanying hail was making my arm and hand very sore as I held the tracker out of the car window. Then we saw that one of the cells that had just passed over Lamar had become tornado warned. 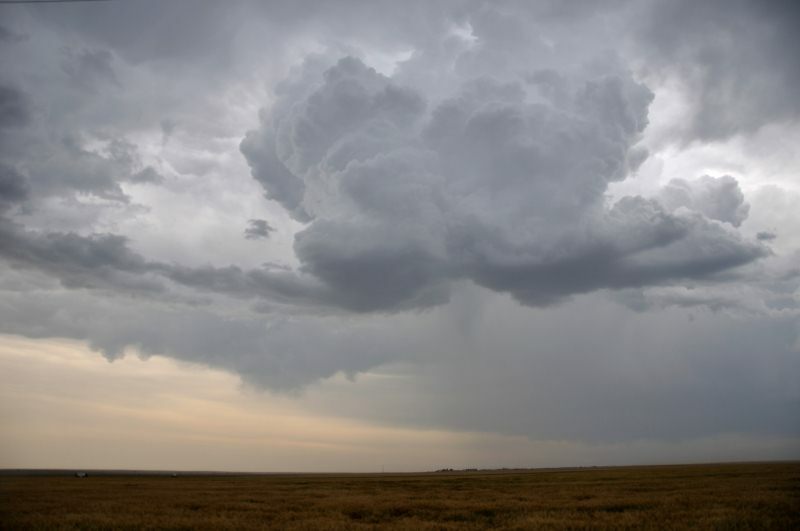 This was quite a surprise as the bases were so high, we couldn't imagine any tornadoes would be possible, but we decided to chase after them anyway. All the poor animals in the fields looked so sad in the aggressive stormy conditions. Not long into our chase and we were behind at least 3 cells that were tornado warned; one directly north, one north-east and one to our east. Unfortunately however, the amount of precipitation coming out of these cells made it impossible to see anything. The drive was fun though in the knowledge that we might see one! A couple of chasers were more to the front of the cells and a couple of gustnadoes were reported on the leading edge of the storm. Along with this, the outflow had kicked up so much sand that a dust storm, known as a haboob had also formed on the leading edge of the storm. 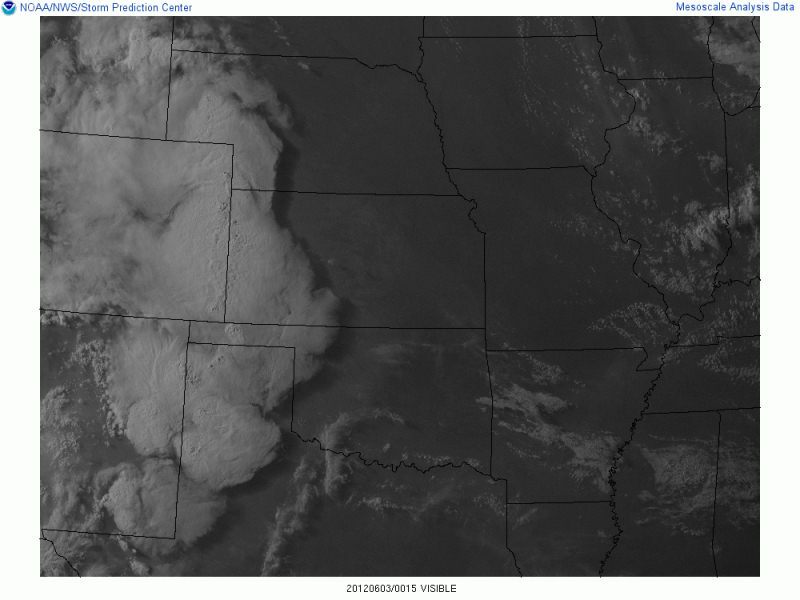 All the cells had pretty much merged to form a huge MCS, which was very impressive on visible satellite. This image is great as you can see the shadow created on land by the anvil and leading edge of the storm. It wasn't long before we were caught up in the dust storm. It was so thick we couldn't see a thing. And it was so windy with it! The lightning was also some of the longest strikes we'd seen but it was impossible to stop and take photos due to the amount of sand. 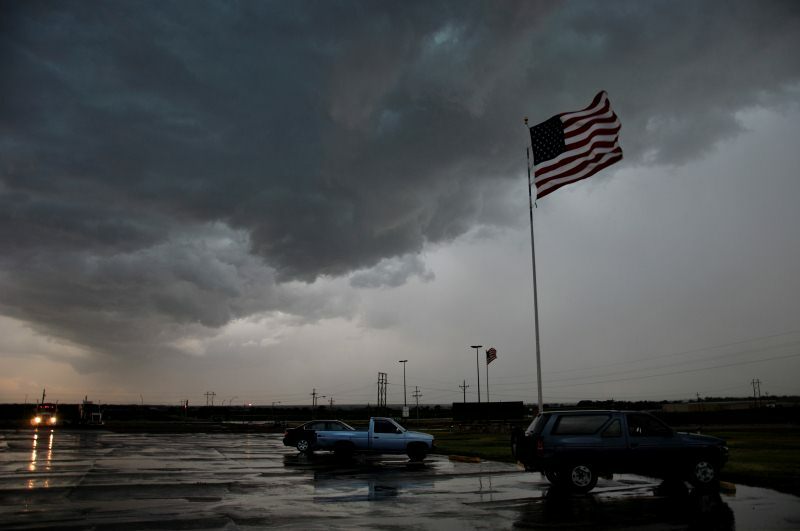 More gustnadoes were reported and a couple of dubious tornado reports. Gustnadoes can often be mistaken for tornadoes. There were also a couple of strikes of lightning that had set light to some woods. A mental day for the emergency services that's for sure. We trailed the storm, caught in the dusty outflow for over 50 miles before it was clear enough to safely open the windows. Altogether there wasn't much in the way of storm structure today, but we can safely say we've ticked another box by driving through a haboob! 3 hours later we arrived in Newton, Kansas, just north of Wichita and bedded down in the car for the night hoping that the repercussions and persistent eastward movement of today's MCS wouldn't squander any hopes we had for the next day's action.